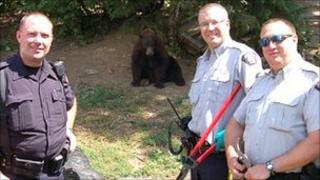 Police raiding a marijuana farm in western Canada were astonished to find black bears apparently guarding it. However initial alarm wore off when officers realised the 10 or so bears did not behave aggressively and were in fact docile and tame. Police believe dog food was used to attract the animals onto the farm in British Columbia. But they say the bears may have to be put down if they have become accustomed to living around humans. Two people were arrested in the raid. The five police who went to the farm near Christina Lake, close to the US border, to dismantle the marijuana plantation were amazed when the bears loped into view. "They were tame, they just sat around watching. At one point one of the bears climbed onto the hood of a police car, sat there for a bit and then jumped off," said Royal Canadian Mounted Police sergeant Fred Mansveld. In Canada, feeding bears is illegal as it leads to bears associating food with humans and increases the likelihood of bears coming into towns and cities to look for food.